The Italian Sea Group's summer of launches continued on the weekend when the new Admiral Regale 45 superyacht touched water. That makes three superyacht launches this summer for the Marina di Carrara-based boatbuilder, following Foam, a fully custom 35m, and Low Profile, a 40m from the Tecnomar Nadara series. 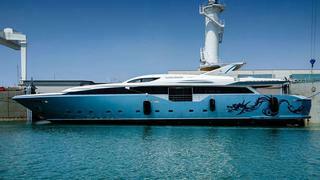 Nakhimov signed the order for new 45m Admiral motor yacht in May 2013. This new boat was christened Flying Dragon, and as if the name wasn't enough, an enormous blue dragon graphic from Dobroserdov Design is emblazoned on down the boat's topsides. And this is certainly a dragon that can fly, with twin MTUs combining with a lightweight planing aluminium hull to produce a top speed of around 27 knots. The main deck features large, open entertaining spaces with full-height opening doors on the starboard side. Forward of this is a dining area for 12 people. Further forward still, the owner's sanctuary comprises the full beam of the yacht, with large windows flooding the space with light and a small opening balcony offering space for morning espressos. Black marble washbasins, a white onyx tub and shower and a light blue onyx wall make up the master bathroom and forward of the cabin is a steam bath set between his and her's changing areas. All four guest cabins are found on the lower deck and include two twin cabins and two double VIPs. More onyx, this time red, borders all the guest beds. The sun deck offers a large sunbathing area, jacuzzi and another dining area for all on board, and the Asian theme continues on the teak underside of the hardtop, which features a large 'tao' symbol. The hardtop isn't the only thing keeping the sun at bay – all outdoor spaces can be screened by Arab tents secured on removable poles. Flying dragon is set the enter the charter market shortly, and will be managed by Nakhimov.